The girl who had never been to a birthday party can finally say, “I partied.” She’s been talking about going to her friend’s birthday party since the day she opened the invitation. Which was a very good day by the way. She excitedly joined right in with the other girls. With a *teeny* bit of mummy’s help, she made jewelry with her friends—a tiara fit for a princess. And a bracelet which she refuses to take off. 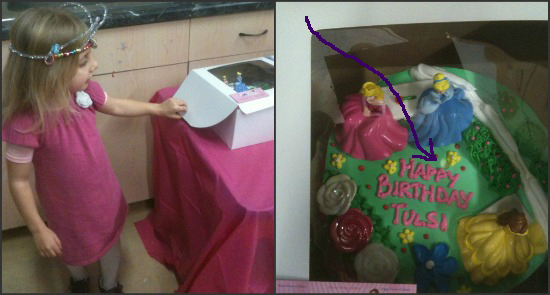 Curious about the Princess cake, before I could stop it, she stuck a tiny finger in the icing. The picky eater who eats like a bird, happily sat (in one spot!) and ate a whole slice of pizza and beamed. Then out came the cake. And where there is cake, there are bound to be candles. This kid loves the flicker of a flame. Not like Drew. Birthday candles come with the promise of good times. ….until she had positioned herself right next to the cake and the birthday action. Up front and centre. I worried she might try to blow out the candles. But she didn’t. She let the birthday girl blow them out while she made her wish. Avery didn’t need to make one anyway. Hers already came true.